The objectif of this project is to monitor three car park slots and to visualise their state on a local network. To achieve this, we use three ultrasonic rangefinders. Knowing the distance between the ceiling, where the sensors are fixed, and the floor, we were able to determine a threshold under which the slot's state changes to "occupied". Each "sensor pack" contains an LV-MaxSonar-EZ4 as well as a red and a green status LED. 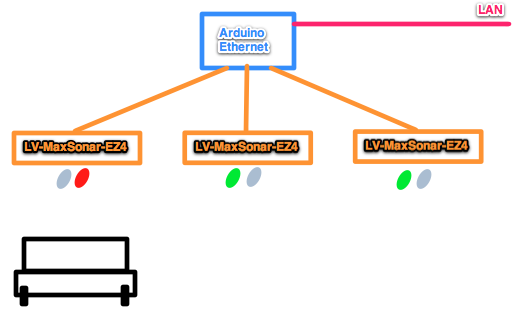 The ultrasonic sensors are connected to the analog inputs of the Arduino, leaving free enough digital pins to command the status LED's.